I found a photo (cut from a text book of Israel Open University: "between Zion and Zionism) taken in the 2nd Zionist Congress (held in Basel in August 1898). 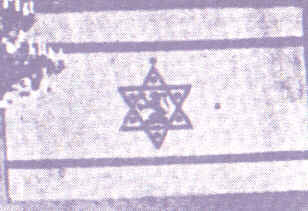 The photo show the first Zionist flag which the current Israeli flag is based upon. The stripes are thinner then the current flag and the emblem includes a lion and 7 stars. In this website is a poster issued in 1947 (image here) celebrating 50 years to the first Zionist congress. 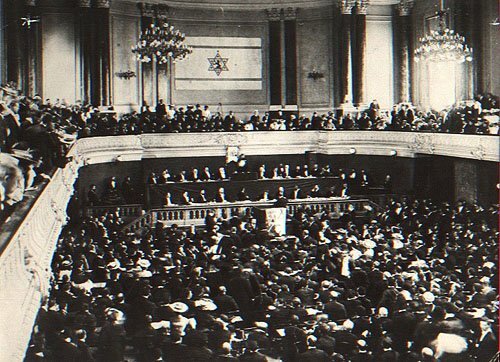 You can see Herzl with two flags, the current one and the first Zionist flag  the one in the black and white photo above. There are many claims for the first hoisting of the blue-white flag. There is Rishon Le-Zion claim of 1885, there is Nes Ziona claim of 1891 <> and there is the American claim of 1887. However, the current Israeli flag was, with no doubt, an evolution of the flag that was designed for the first Zionist Congress in 1897 by Wolfsohn, who, probably didn't know a thing about those early flags. Therefore, the origin of the national flag can be traced directly only to the flag that was designed by Wolfsohn, while all other flags (even thou may resemble to it) can't be directly connected or made any influence on its design. 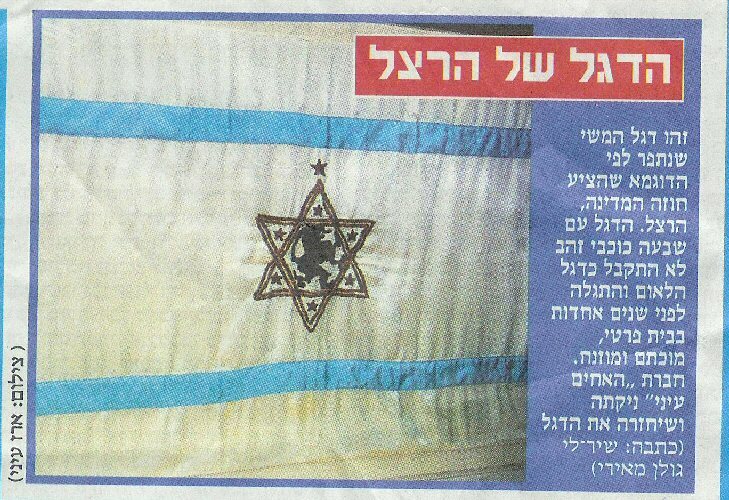 In the Independence Day issue of the daily "Yedi'oth Akhronot" of yesterday, there was a piece (with a photo) about Wolfsohn's flag with a lot of incorrect information. You can see it here. This is the silk flag that was sewed according to the example suggested by Herzl the prophet of the state. The flag with the seven gold stars wasn't excepted as the nation flag and was discovered few years ago, stained and neglected, in a private house. Eiyny Brothers company cleaned and reconstructed the flag. (written by Shir-Li Golan Meiri, photo by Erez Eyini)." Nevertheless, it time the flag lost its gold lion and seven stars, the gold MD was turned into blue and the stripes became wider and in 1933 the current national flag was adopted by the 18th Zionist Congress. The first flag that may be called official Zionist flag was that one allegedly used on the First Zionist Congress, as per drawing on the 1947 poster celerating 50th anniversary of the Congress. There is no evidence that this flag was used on the 1897 Congress, but there is a photo of a very similar flag used on the 1898 Congress. I have made my drawing according to the 1947 poster, but one may easily argue that I should have followed the 1898 photo instead. David Wolfsohn, the designer of the flag for the first Zionist Congress (held in Basel, 1897) tells in his memoirs (published in a book that was issued in the 1920' - "The 25th Anniversary to the first Congress Book") about the brainstorm that brought to the design of the blue stripes and adds: "I ordered to make a blue-white flag and to draw a Magen David inside it". I had some doubts about those statements. From the photos we already know that in reality the stripes were thinner from those that appear in 1947 poster, but moreover, we can learn that the central device was in gold and included not only a Magen David but also seven gold stars and a lion, which wolfsohn failed to mention. Well, I was invited to give a lecture during a "Magen David Festival" held in the city of Yavne on passover. Just before me, there was a lecture by Dr. Haim Grossman, who lectured about "Herzel and the Magen David", and his findings gave me the missing link. 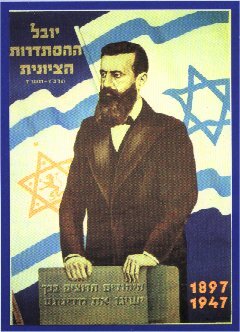 As we know, Herzl's idea about the flag of the Jewish homeland was made of seven gold stars on white background. 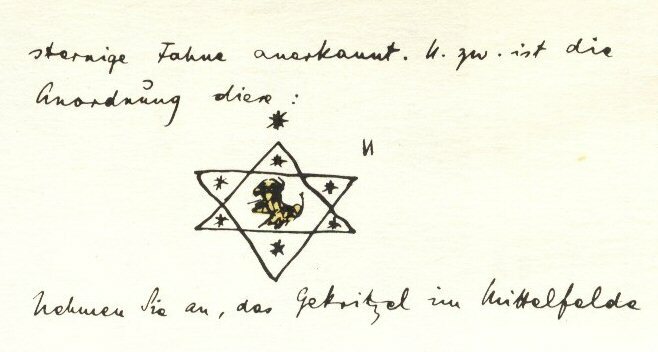 Dr. Grossman sent me scan from Herz'l diary in which one can see that the stars were arranged as such: 6 stars will make a virtual Magen David and the seventh star will be above them. Putting gold stars on white flag is not a good idea as in quite a short distance this flag will be seen as white-only flag, and therefore, it is not surprising that it was not adopted. However, Herzl design one thing more. He design an emblem for the Zionist Congress. Again, thanks to Dr. Grossman findings, we can see that Herzl's idea was exactly the same as the central device of the first Zionist flag. So, Wolfson may "invent" the blue stripes but for the center of the flag he took the Zionist Congress emblem designed by Herz'l. 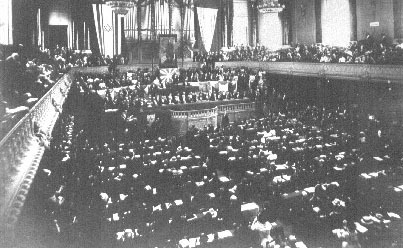 From photos we know that this flag was in use for, at least, the three first congresses as seen in photo from the 3rd congress - Basel 1899 at <www.jafi.org.il>. It seems that later on there were changes in the flag. We don't have too much information but from old photos it seems that the first change was making the central device in blue too (my guess, so it will be seen better), and later the omitting of the stars and lion (they are missing already in the flag of the 10th Congress - Basel 1911 as seen in photo at <www.jafi.org.il>, but probably those omitted before that) and the change in the stripes (10th congress had two stripes: one narrower and one wider - the narrower was omitted sometime later). The flag as we know it today was finally adopted as the Zionist flag (without specifications) at the 18th Congress (Prague - 1933). 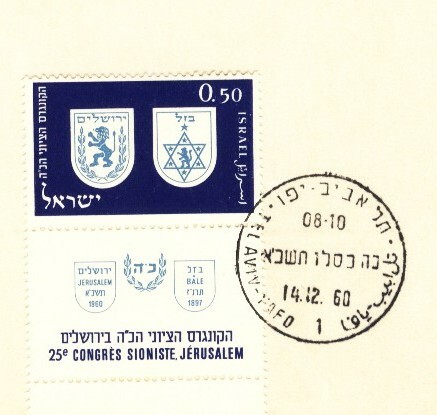 The emblem also appeared side-by-side with Jerusalem municipal emblem on a stamp issued for the 25th Congress (Jerusalem 1960) as seen in a scan, also contributed by Dr. Grossman.